From the moment your eyes open to the last minute of the day, your life is filled with nonstop action. If you aren't careful you can become so overwhelmed in meeting the demands of life that you forget to spend time with your Creator and Sustainer. 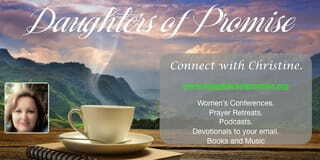 Our daily devotionals written specifically for women in all walks and stages of life, will change the outlook of your day and give you the inspiration you need! Spending any amount of quiet time in the Word of God will refresh and encourage. Find a Bible devotion here and see how God can work through you to make today a joyful day! It seems that Jesus needs to get away from the crowds so he takes His disciples and walks a day’s walk north of the Sea of Galilee. When they get there, Jesus asks His disciples who people say He is. They reveal that the most popular answer was that He is John the Baptist – raised from the dead. Others say ~ Elijah. “Who do you say that I am?” Jesus asks. Peter answers that Jesus is the Messiah, the Son of the Living God. Jesus then blesses Peter ~ something rabbis do when a student gives the right answers to important questions. One of the differences between Jesus and every other Rabbi-teacher is that Jesus can sense the heart behind the answer. He knows whether Peter is giving lip service to impress Him or if Peter’s whole heart is engaged as he makes the proclamation. Jesus read people’s hearts then and He still does it today. As I teach the scriptures, as I sing the worship songs, or as I answer questions in a class, Jesus – who sits at God’s right hand – can tell if I’m going through the motions for reasons other than divine affection. How easy it is to try to fool people when my heart isn’t in it. Knowing the right answers can often get someone far but not far at all with Jesus if the heart is darkened. It’s painful to be fooled, isn’t it? Perhaps your search committee asked all the right questions of a prospective pastoral candidate. He was impressive in his answers. Time revealed a deeply flawed character, however. Perhaps you asked your would-be spouse where he/she stood with Jesus. The right answer was given and it appeared sincere. When memories of standing at an altar were dimmed, so was any remnant of their faith. Time reveals the fidelity of faith. It certainly did for Peter. The other eleven disciples could not tell for certain if Peter was caught up in the emotion of the moment or if his faith would carry him through a lifetime of hardship. As it turned out, Peter would end well. He was no charlatan. He was also not someone who was power hungry. Persecution has its way of weeding out all pretenders. Peter ran the race and finished upside on a cross.